I have a Pat Sloan Crush! So here is Crush! Great pattern and the colors in this line are so perfect, the grays and oranges...TO LIVE FOR! 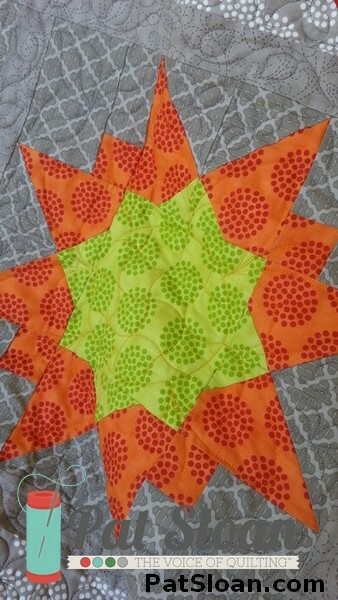 I had a great time making this quilt top and would like to do another that I get to keep just for me! The pattern is easy to follow and it goes together pretty fast, which I love. To see more ( and there are many more) fabrics in this line visit Pat on youtube. She has some real eyepoppers! I made the decision yesterday that this will be the line I am using for my Tula Pink City Sampler Quilt Along that will be starting May 20th hosted on Sew Sweetness! Hope you will all join us for this event!!!! 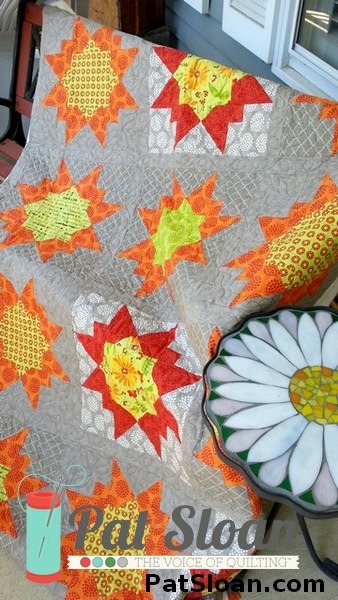 What a beautiful quilt, love the fabrics used. Dang I wish people would stop designing such great fabric! 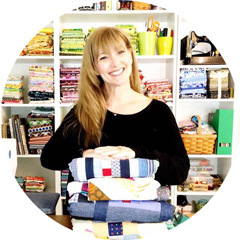 Selvedge /quilt word love! Fabulous quilt and I really like the pattern! The pattern looks interesting - something between star and flower. I like that you used red fabrics to make some interesting inset. thank you for helping me out... you are DA BOMB DOT COM!!! See you in a FEW DAYS! What awesome fabric. Love the colors. I will be sure to look for this line. See you on the Flickr group for the City Sampler soon.